DJI's latest product isn't a drone, but that doesn't mean it's not interesting. 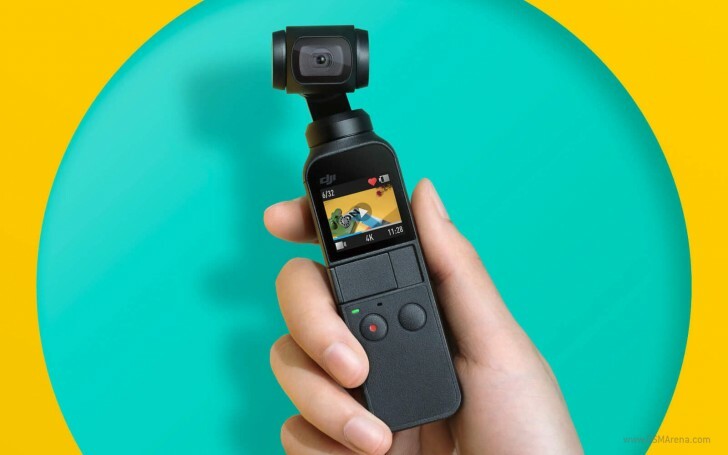 The Osmo Pocket is a small camera that's three-axis stabilized by its own gimbal. It shoots 4K60 video at 100Mbps with its 1/2.3" 12 MP sensor that has 1.55μm pixels, f/2.0 aperture, and an 80-degree field-of-view. The Osmo Pocket has dual mics, as well as an 875 mAh battery that should last up to 140 minutes and charges from 0 to 100% in 73 minutes. The Osmo Pocket has a sandstone finish non-slip and sweat-proof handle, and a built-in 1" touchscreen paired with buttons for a single-handed user experience. If that's not enough to get the framing just right, you can plug in your iPhone or Android device into a modular port on the side (it comes with USB-C and Lightning adapters) for a bigger viewing screen. 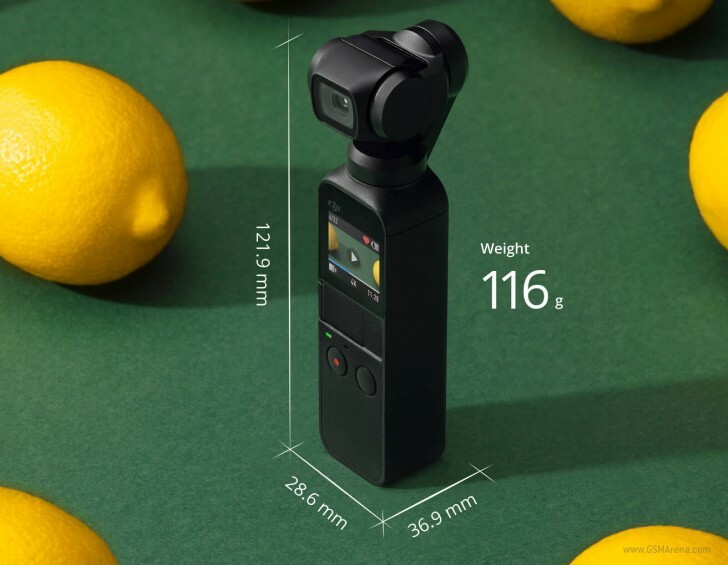 The device's dimensions are 121.9 x 36.9 x 28.6 mm, and it weighs only 116g. You can pair loads of accessories to it: a charging case, wireless module, extension rod (don't call it a selfie stick), waterproof case, ND filters, a controller wheel, a 3.5mm adapter for external mics, and more. The hardware isn't everything - you can use Pro mode to manually adjust camera parameters, shoot RAW photos and D-Cinelike videos, while Story mode uses "a combination of preset shooting patterns and camera motions to help you create professional quality video", with "exclusively designed filters and soundtracks" to "give a unique finish to your footage". All of these options can be found in the companion DJI Mimo app for smartphones. Osmo Pocket has NightShot, a tripod-free night mode with 2-3s handheld long exposures. Motionlapse, on the other hand, adds smooth camera movement for dramatic effects on top of Timelapse shots. You also have the option for 3x3 panoramas, actively tracking subjects, and First-Person view mode which follows the gimbal's orientation to find "thrilling action shots with smooth results". 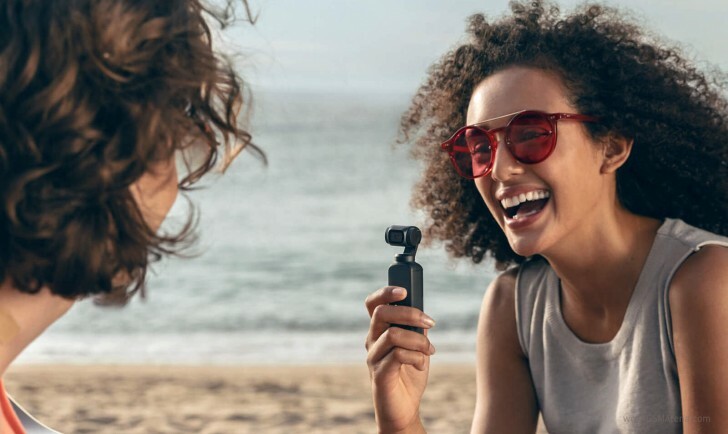 The DJI Osmo Pocket is up for pre-order now for $349. It will ship on December 15. Great, now make one with a 1" sensor, same 12MP res, f/2 aperture and 80* FoV and a larger screen and battery and I'm sold.